In a rare interview published last week, Apple's former head of iOS development Scott Forstall discusses a wide range of topics that offer a peek behind the scenes at the company during the genesis of iPod, iPhone, iPad and other landmark devices. Former Apple executive Scott Forstall on Philosophy Talk's The Creative Life. Forstall sat down with Stanford philosophy school faculty Josh Landy and Ken Taylor in an episode of Philosophy Talk's The Creative Life, a road show installment of the Philosophy Talk radio program that airs twice a week in the San Francisco Bay Area. The installment, spotted by 9to5Mac, was taped in October 2018 at New York's Stuyvesant High School. Before starting at NeXT in 1992, which was later assimilated by Apple, Forstall obtained bachelor's degree from Stanford in the philosophy-related field of symbolic systems. In fact, Taylor is now director of the university's Symbolic Systems program. Forstall remained at Stanford to secure a master's degree in computer science. 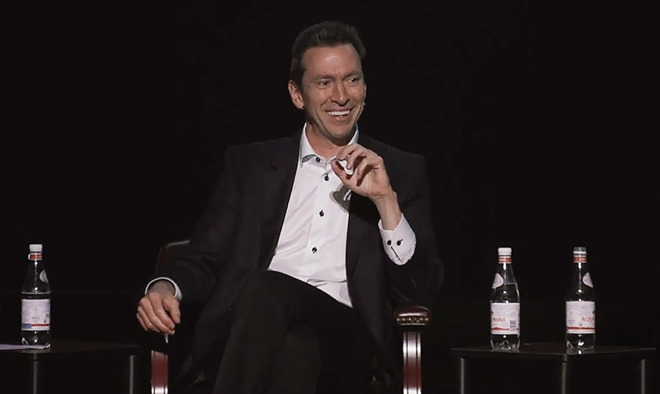 As referenced by the show's title, Philosophy Talk places heavy emphasis on ideologies and the impetus behind human actions, allowing Forstall to recount his time at Apple through that lens. While the interview covers well-trod ground, it does yield a few tidbits on Apple's corporate thinking and management style. The former tech exec's transition to Tony Award-winning Broadway producer acted as a jumping off point to Apple-related lines of questioning. Despite being seemingly disparate endeavors, tech and theater share surprising similarities, Forstall noted. "The disciplines, the fields are very, very different, but creating a Broadway show is incredibly similar to creating a tech startup," Forstall said. "Both of them start with very creative individuals who start with whole cloth, they're looking to create a new product. And in the case of tech it's maybe an application or a device and in Broadway it's creating a script." The first Apple callout came early when Forstall shared an anecdote regarding risk, which in this case related to his decision to shift career tracks. According to Forstall, risk taking goes hand-in-hand with innovation. "At Apple one time, Apple had been close to bankruptcy and we come out with iPod, the iPod finally is selling OK and we had the best-selling product, unit-wise, in the history of the company and then we came out with the iPod nano," Forstall said. "We knew we were going to develop it and we canceled the entire iPod mini line before we even shipped the new product and it could have devastated the company. But we did it because we believed in it and so we took risks." On the topic of fostering creativity, Forstall said environments that support creative thinking can be created through proper resource management. During his time at the head of the Mac team, Forstall would give every employee in his department a month to work on pet projects at the wrap of each major Mac OS X release. The projects would be presented to management and, if deemed worthy, Forstall himself. "One I saw was this idea of a ten-foot user interface, and I loved it and we turned it into Apple TV," he said. "Apple TV was invented because someone was encouraged to do whatever they wanted for a month and we turned it into a product." Forstall waxes poetic on creativity throughout the wide-roving talk, which leads to a particularly interesting morsel regarding the importance of having a diverse educational background. In tech and other seemingly scientific fields, standouts often have experience in a variety of disciplines. Those who are limited to concentrations in one practice or group of studies, such as STEM, at times lack the creative foundation to "think different." As the interview winds down, Forstall discusses what he regrets most about how people use iPhone, suggesting the device has become too ubiquitous in modern life. For example, no devices are allowed on the table during meals at home; that time is reserved for human interaction. "I used to say, 'I don't like when I see it, I don't like when I see people at dinner, out at a restaurant doing that,'" Forstall said, mimicking a person texting. "The second thing is I don't like when people walk down the street just staring at it as opposed to looking around and actually having conversations with people. So I actually think iPhone's a tool. Now I look at it and say well, it's enabled people to have social media. Now there are these cones of...these echo chambers that are destroying a lot of stuff. And that's much more worrisome, but I think that you can create something and there's going to be good and bad uses of it. We have to feel morally responsible to have an ethical creation and use of our products." The entire interview spans some one and a half hours, a good portion of which concentrates on philosophical discourse. Forstall's segment begins shortly before the 17 minute mark in the video above.